I'm a real fan of sp map for all FPS games and most of them are reviewed (when I have time) at The sp map corner. 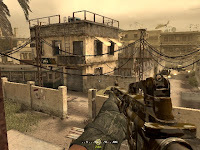 Since all the World War base FPS are something unique (MOHAA, COD, COD2,COD4...) I thaught it would be a good idea to create an entire blog dedicated to those games. None If I understand right this was a modification, throught adding a strong sp gameplay, to an originally made MP map. In this map the Author, mainly focussing on scritping, wanted to create a map oriented in a possible disturbing gameplay through playing as a enemy of the american troops...The goal is oriented in a multi purpose mission with a major one that is to old the place. 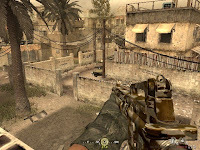 Gameplay is quite restricted due the posibility and the size from the map. It has for sure in some place a quite clostrophobic feeling but the author was able to create an intense experience that didn't make you feel like being blocked in a small township. Objectives are well trigered to make the mission intense, travelling can be sometime approxiamtive and the use of the compass is really necessary to know where to go next. Hopefully you have a lot of squad mate that make the experience more ballanced that if you were alone. Challenge isn' t that difficult and this is perhaps the minor issue of this map conversion. In conclusion: Alex was really able to create an intense and well scritped experience that except the point of vue ('enemy' role) was really enjoyable, with a good mix between objectives to achieve and combats. THis one is for sure a one to be tested.